Down & Dirty: Legalize absinthe! The blurriness of this image is because I shot it with my camera phone, NOT because I was under the influence of Absinthe. That came later. Michael and I visited our friend Jim in Santa Fe and topped off the evening with a glass of Absinthe, the famed green intoxicant so beloved by 19th century French artists. I've wanted to try it ever since I wrote a paper on its primary herbal component (Artemesia absinthium aka wormwood) in 2002, but it's illegal to sell in the U.S. (for no good reason, trust me). We sat in Jim's backyard, under the apricot tree hung with candle lanterns, eating, talking, drinking, and breathing in that wonderful desert air. 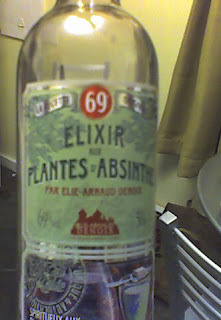 It'll be six months before we're there again, and Absinthe or not, I'm looking forward to the trip. Very cool! Where did the absinthe come from? Not the French stuff but available in the US. your life sounds SO dang good, el! funny, i was just talkin' 'bout absinthe the other day.